2.2 freeze handles working at the same time. 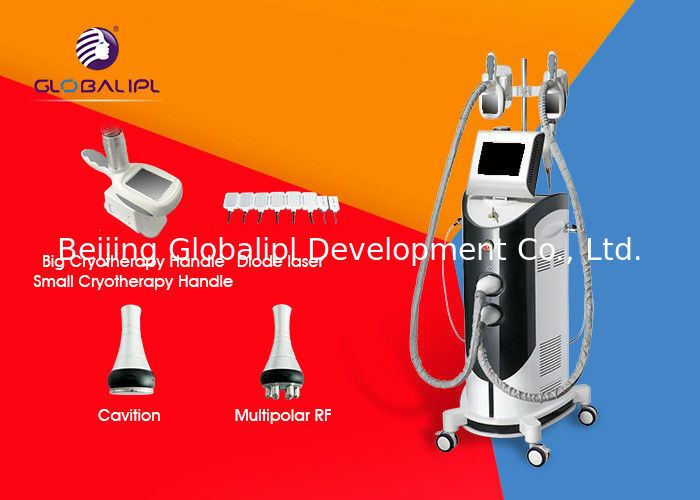 Fat freeze+Vacuum+Cavitation+RF+Diode Laser: The treatment result will be more visible, while combine with fat freeze treatment and ultrasonic cavitation. Cryo is a non-invasive (without contact) procedure in which doctors place a small suction cup on a patient's skin. The device gradually extracts body heat until the subcutaneous fat is frozen. Ultrasonic vibration may cause flerce impact of fat cells to make them be exploded instantaneously,reduce the amount of cells and thereby achieve the effects of removing fat. 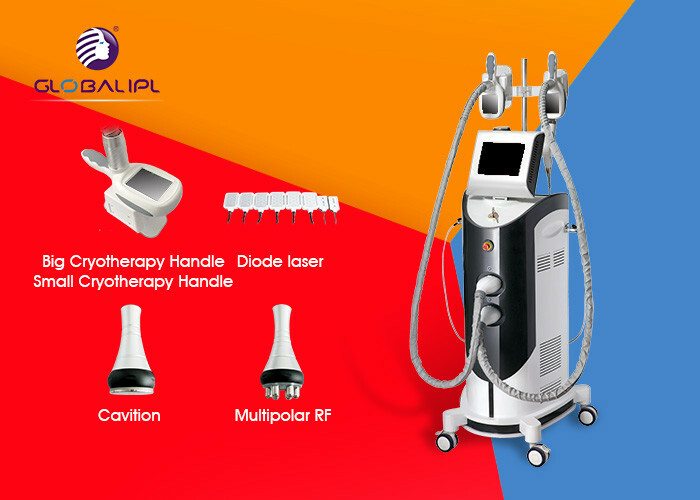 The lipolysis diode laseropen and release glycerol, water and free fatty acids, thus, causing to lose weight and inches. Fat freeze is a medical device used to destroy fat cells. Its principle relies on controlled cooling for non-invasive local reduction of fat deposits to reshape body contours. The exposure to cooling is set so that it causes cell death of subcutaneous fat tissue without apparent damage to the overlying skin. The procedure is billed as a nonsurgical alternative to liposuction. 2. 2 fat freeze handles can be work together or separatly. 3. 8.4'' LCD Touch Screen, beautiful and easy operation. 4. Japanese Top-level Cooling plate, ensure steady cooling, good effect, long life. 5. 24hours working without stop.